GREG LUER scored a hat-trick in his final game for Burgess Hill this afternoon as they won 5-1 at local rivals Worthing in the Ryman League South Division. It was the perfect way for Luer to mark his final game for the Hillians as he will now link up with Hull City’s development squad. Hillians started the day unbeaten in the league, with 16 wins and five draws from their 21 league games, while Rebels went into the game on the back of a five match unbeaten run, which had seen them climb to sixth in the table. The impressive visitors led 2-0 at half-time, before making it 3-0 early in the second half. Omar Bugiel pulled a goal back on 72 minutes, before Luer struck twice more to complete his hat-trick. 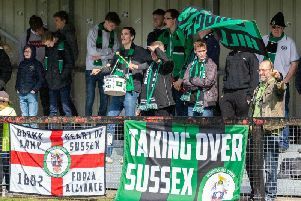 In front of a season-high crowd of 448 at Woodside Road, Burgess Hill had a penalty appeal waved away after just two minutes when Rob O’Toole went down under a Matt Hurley challenge, before Rebels’ Jaz Rance, on the stretch, volleyed over at the other end a minute later. The visitors took the lead on nine minutes when Luer, Hillians’ captain for the game, got to O’Toole’s cross before Worthing keeper Jack Fagan to head the ball home. Hurley then cleared the danger when Hillians’ Pat Harding was waiting to tap home Sam Fisk’s low cross from a couple of yards out. Hillians doubled their lead on 17 minutes. Worthing defender Will Berry headed the ball back to Fagan, whose headed clearance went only as far as Burgess Hill midfielder Darren Budd. His scuffed shot from 40 yards found its way to Harding, who took a touch and looped the ball in to the empty net, before the back-peddling Fagan could get back in time. Adam Hinshelwood’s side responded well to falling two goals behind and went close three times in two minutes. Ben Pope hooked the ball over from close range, Curtis Gayler had a low strike saved by the feet of Burgess Hill keeper Josh James and Gayler then saw a shot from 35 yards fly narrowly over. Rebels had another opportunity to pull a goal back just before half-time but Ryan Quirke fired into the side netting after Rance pulled the ball back. Fagan produced a superb double save to twice deny O’Toole on 50 minutes, before the visitors did get a third on 58 minutes. Luer got away down the right and crossed for Budd to slide the ball home from eight yards. Bugiel got a goal back when he slotted home from 15 yards on 72 minutes but Luer netted his second from close range following a cross from the left just two minutes later. Luer then completed his hat-trick just four minutes later when Worthing’s defence failed to clear the ball and Fisk unselfishly squared the ball for Luer to tap home from six yards. Burgess Hill sub Dan Perry had a well-hit strike from 20 yards tipped over by Fagan on 82 minutes, before James kept out Will Hendon’s low shot at the other end two minutes later.